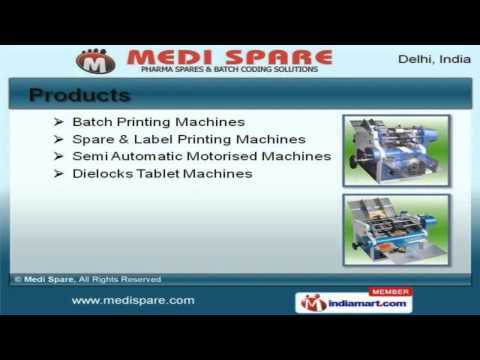 Welcome to Medi Spare, Manufacturer and Supplier of Printing and Machinery Products. The company was established in the year 2010. Ethical business policies and Hassle free operations make us different from others. International quality standards and Assured quality products help us to serve Key Customers like Marino Laminates & Marion Biotech. We offer a wide array of Batch, Spare and Label Printing Machines. Our Rotary Machine and Thermostat Spare Parts are best in the industry amongst others. We offer Ink Rollers, Printing Inks and Plastic Fingers that are in huge demand across the global markets. Food Grade Grease, Silicon Spray and Sifter Sieves offered by us are some of our best selling products. Along with that we offer Gumming Rollers, Massage and Labelling Belts that are a class apart. We also provide Roller Cleaner, Filter Pad and Clamp Gaskets that are extremely reliable.